Wind resistance is one of the most important resistances a cyclist has to overcome (together with the rolling resistance of the tires). 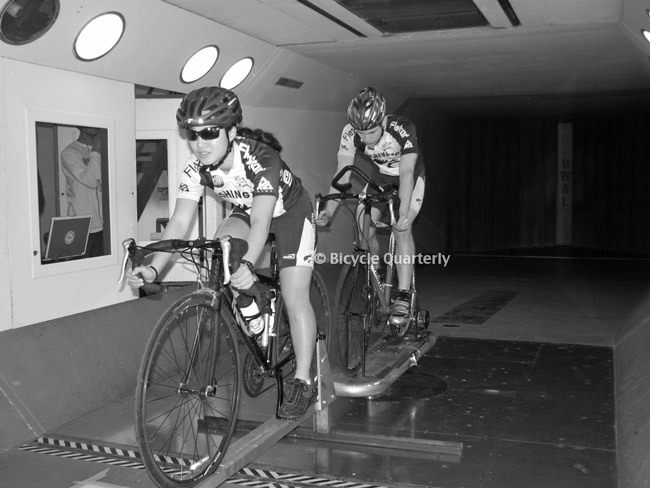 Most wind tunnel testing has been done for time trial equipment, but aerodynamics are important for real-world riders as well. Without any data, many people assumed that fenders and handlebar bags would increase the wind resistance, whereas saddle bags were shielded behind the rider, and thus would not affect the resistance. Others maintained that fenders could act as fairings (racing motorbikes have them!) and make the bike more aerodynamic. Similarly, it is easy to envision wider tires having higher wind resistance, but how important is this effect? And how does it compare to the rider wearing a jacket? To look into all these factors, we spent 2.5 days in the wind tunnel of the University of Washington a few years ago. A top-tier wind tunnel is an impressive facility. Usually, wind tunnel time costs $500/hour, but the Department of Aeronautics allows students free wind tunnel time for their projects, and two students were keen on studying bicycle aerodynamics, so we collaborated on this study. As a result, I got to ride a trainer for two days at 111 rpm and 20 mph, while keeping my riding position constant as we changed various parts on the bike to test how each affected the aerodynamics. The trainer originally had been built for Lance Armstrong, who had tested his time trial position in the wind tunnel a year earlier. The setup could be rotated by remote control to test the effects of crosswinds. A camera projected my image in front of me, so I could check my position against outlines traced onto the floor. What about the results? The most important finding probably does not come as a surprise: What you wear and how you position yourself on the bike has the largest impact on the aerodynamics. For example, simply raising your stem by 20 mm (3/4 in) increases the drag by 5%. (For comparison, other studies indicate that aero wheels bring an advantage of only 3%.) The difference between a close-fitting jacket and a looser cycling jacket is a full 8% increase in the overall wind resistance of your bike! Perhaps more surprising to many, front bags were more aerodynamic than rear ones. A handlebar bag was more aerodynamic than a Carradice saddlebag that extended just slightly beyond the hips of the rider (see photo at the top of this post). Front panniers (on low-rider racks) were more aerodynamic than rear panniers. Fairings actually increased the wind resistance in most positions. We tested many different fairings, and the photo above shows the “best” setup, and even that decreased the wind resistance only if the rider assumed a full aero tuck. It’s obvious that fairings only work if they form one body with the rider. Otherwise, you are just pushing one extra object through the air. Speaking of the aero tuck, that was perhaps the most eye-opening result: A full aero tuck reduces the rider’s air resistance by 38% compared to riding “on the hoods.” There is nothing you can do to your bike that makes even nearly as much of a difference at high speed! Well-mounted metal fenders do not affect the bike’s aerodynamics. The front section of each fender shields the tire and reduces the wind resistance, while the rear fender increases the aerodynamic drag. The two effects cancel each other. We also tested how the effect of drafting. Everybody knows that riding behind another cyclist decreases your wind resistance, but we also found that the front rider benefits from the draft, receiving a push from the rear rider. And what about those wide tires? The data showed a very slight increase in air resistance when going from 25 to 32 mm tires, but the difference was too small to be statistically significant. It may be real, or it may just be in the noise of the data collection. In any case, it’s smaller than many other factors, such as your stem height or the clothes you wear. There were many other things we tested during those 2.5 days in the wind tunnel. It was very interesting, and it has influenced how we set up our bikes. 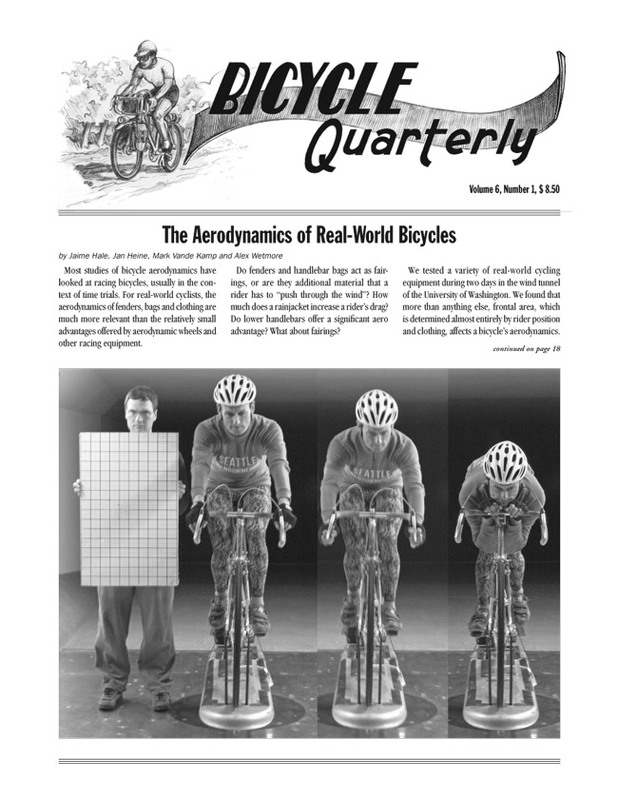 The full results were published in Bicycle Quarterly Vol. 6, No. 1 and Vol. 6, No. 3. That’s a great issue: worth getting for those who are interested. You show how the loose jacket (above) comes with a very stiff drag penalty, an important lesson. And maybe Stephen Roche’s recent comments about riders keeping jerseys zipped is in the riders’ best interest!. But I wonder how wool jerseys compare with synthetic light-weight jerseys. The tests indicate that it’s all about fit of clothing. A mountaineering jacket actually increased the drag by 19%, because it fit looser than the jacket shown and had a hood. So I suspect that wool vs. synthetics isn’t different, if both jerseys fit the same. About fairings: I’m reminded of riding my bakfiets into a strong headwind with the canopy covering the box. If I get low enough that my nose is nearly touching the back of the canopy, there’s a huge drop in wind resistance, but if I straighten up even a little from that position, it’s hardly any different from sitting fully upright. About drafting: As I understand it, the rider in front doesn’t really get “pushed” from behind. The benefit comes from a decrease in energy going into turbulence in the air. This is the same reason why speedboats are very long and skinny. The idea is to get as close as possible to laminar flow, putting as little energy as possible into disturbing the air (and/or other fluid). 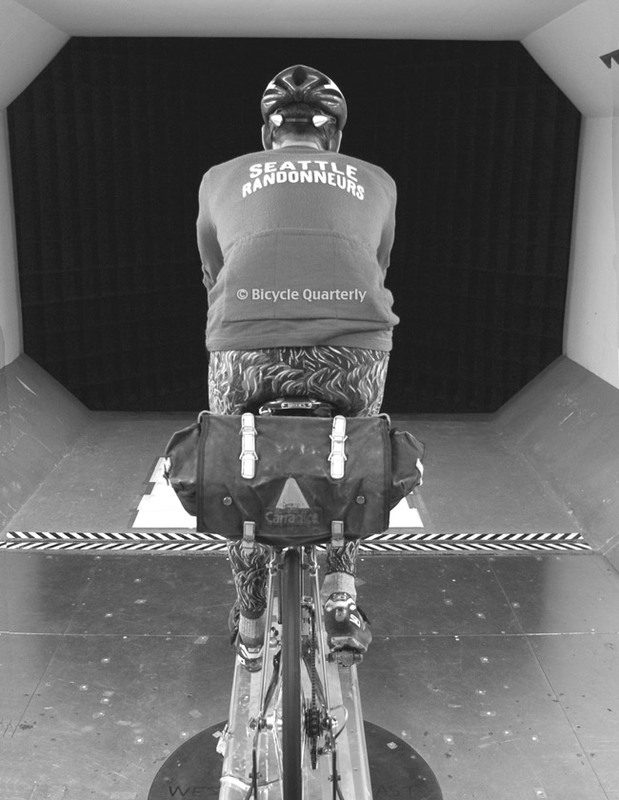 There is no laminar flow on an unfaired bicycle – it’s not a very aerodynamic shape. You can feel the pushing when you are passed by a truck – there is a wave that pushes you forward before the truck even reaches you. Similarly, when you watch a bike race, you can see that the trash in the gutter is starting to be blown forward before the peloton arrives. 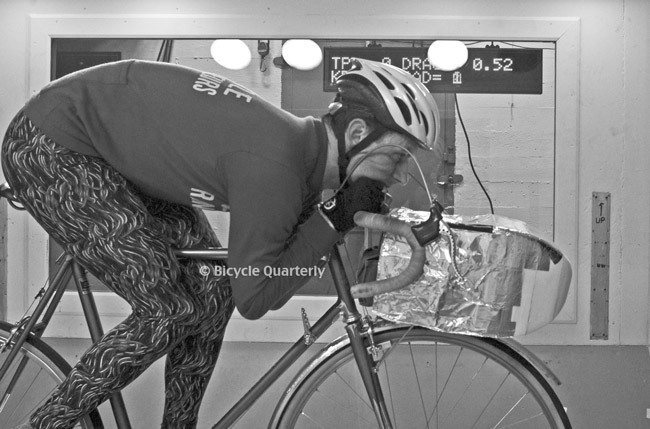 We did not appreciate how cold it is in the wind tunnel, and those tights were all we had on hand. Once I started wearing them, I had to keep them on for consistency. A better story would be that the wavy lines are small tufts that show the airflow around the rider’s legs, but alas, they are just printed onto the fabric. They were home-made, way back in the 1980s, when neon fade paint jobs were fashionable. You guys missed an opportunity to test the drag of Fur on legs vs. Shaved Legs. We tested only variables that had the potential to be significant. The value of deep profile, aero rims for cyclocross is in their ability to shed mud and sand, not the aerodynamics. I suspect that pro racers use deep-profile rims because their sponsors want to show that these wheels are strong enough for cross. Of course, then everybody copies the pros… and nobody is complaining about the sales of expensive wheels to amateurs. If the only differences which mattered were those you can notice without careful measurement, Jan could save a lot of time and effort in his tests, following instead the lazy practices of so many other web sites and magazines. A 2% difference in power in racing is huge, but falls well within the “noise” of how you feel ride to ride. That doesn’t mean it doesn’t have a substantial influence on race results. That is not how I read the comment. It’s neat when our tests match somebody’s experience. Track racing actually is a great test, because you can get lap times under controlled conditions. So it’s pretty easy to test what works. I suspect that a 2% difference in bicycle speed due to different setups would show up very quickly on the track. Very interesting testing and results. Did you perform any tests at speeds less than 20 mph? I would be quite interested to know if there is a speed above which aerodynamics becomes a significant factor but below which it is negligible. 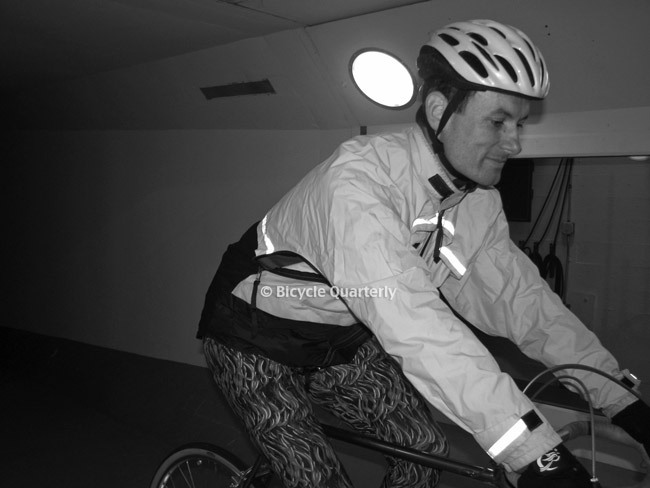 It may turn out that a skin suit and aero tuck may be quite unneccesary when riding averaging 15 mph or less? We tested at 20, 22 and 24 mph, and then performed a regression analysis. We calculated drag coefficients, which you can put into the standard formulas for bicycle speed and power, for example, at analyticcycling.com. Then you can see for yourself how big a difference it makes. In Vol. 5, No. 1, we published an article “How to make your bicycle faster,” which looked at various factors, and various speeds, to see which made the biggest difference. Obviously, aerodynamics will be most important if you go fast. For all riders, tire resistance made the biggest difference, simply because there is so much variation between tires. Aerodynamics are hard to change significantly – once you have a performance bike and tight-fitting clothes, you might be able to get 10% more aerodynamic, whereas the difference between a supple performance tire and a belted touring tire can be on the order of 100% (one has twice the resistance of the other). Yes, indeed, very interesting, especially the emphasis on “real world cycling/cyclists”. As a primarily commuter/recreational cyclist (approaching 70) who has raised his bars, even gone to French porteur style uprights on a couple of (25-year-old) bikes, I still realize that my position makes a lot of difference when pedalling into a headwind. Speaking of handlebar heights led me to go back and review a number of profile photos that have appeared in the Quarterly of randoneusse and other bikes. Many with their bars very close to saddle height would appear to be giving away the low bar postion aero advantage, at least on the tops and hoods. Yes? On the subject of saddle/bar heights; what happens to “stand over height” on those bikes that have the traditional short seatpost extension above the frame? I used to ride frames sized that way 40 years ago but can’t remember about the stand over height. Maybe we didn’t worry about it back then. Standover clearance isn’t a concern for me. I never put both feet on the ground at the same time, much less jump off the bike with both feet flat on the ground. You must have some pretty short traffic lights up Seattle way. I never thought about standover clearance, until a reader asked about it. I went to the basement and checked, and indeed, I did not have standover clearance on the bike I was riding at the time. Lest you think that only experienced cyclists can ride bikes without standover clearance, my son’s bike didn’t have standover clearance when he got it. The saddle was all the way down. He was 6 years old at the time, and even he never had a problem with it. I doubt sponsorship is a reason why ‘cross racers use deep dish rims. I know for an absolute fact that this isn’t the case with at least one two time World Champion. I wrenched for Erwin Vervecken when he visited the PNW a few years back. He was riding Fir deep dish carbon wheels and said he paid for them out of his own pocket. I also know there are some other top ‘cross racers have purchased Lightweight wheels with their own money. BTW when I asked Erwin why he rode aero wheels in ‘cross he simply responded that they were faster. I suspect it’s as much a placebo effect as anything else but even a placebo effect can still have a positive effect on performance. Very interesting post. Is there a theory as to why a handlebar bag creates less drag than a saddle bag? It doesn’t seem very intuitive to me. The people at the wind tunnel weren’t surprised by this result. They pointed out that the ideal aerodynamic shape, a teardrop, is wider at the front and thinner at the rear. So any rear bag sort of messes up that ideal airflow, whereas a front bag fits nicely into the profile of the teardrop. Along the lines of what Andy wrote, I recall a bunch of automobile people saying that the Porsche 911 had better aerodynamic properties when driven in reverse. I have heard the same, but according to my source, it was the Porsche 928, not the 911. There’s a lot to learn on this subject from the folks in the triathlon community (check slowtwitch.com), a lot of which is about gear, of course, but some of which reflects the common sense information you report here. The one thing I don’t see mentioned is the cost to performance that getting lower might exact. Triathletes and time-trialists have discovered that getting low (dropping your stem, say), might actually harm your results if you can’t produce adequate power in that position. Powermeters (crank or hub based) are an important tool in this discussion, because in a time trial the only thing that matters is who has the fastest time, not who is more aerodynamic. Definitely, you need to be comfortable to put out power. The ideal position is one where you still are comfortable, and yet low. Where that position is depends on your body and the distance you ride. Miguel Indurain was a great example of this. In terms of aerodynamics his position was considered to be pretty terrible but when they tried to put him into a more aero position his power output dropped and he wound up being much slower. My low profile rims don’t collect much mud either. I’ve also had a completely mired bike in cyclocross races to the point that the wheels won’t turn but there still isn’t much mud on the rim itself. The fork crown and chainstay/bottom bracket area are where things get jammed up. The argument I have heard for deep dish cyclocross rims is that they plow through sand and deep mud better. I don’t buy it though because the tire is significantly wider than the rim and acts as the plow at all but the slowest (walking?) speeds. 38% less resistance in an aero tuck is quite an impressive number. Was this position one that you could still ride in though? At some point, your loss of efficiency from being in an awkward knee-in-chest position loses out over the aero benefits, and it surely looks like you’d induce Shermer’s neck if you tried to ride that way for any length of time. Even TT racing bikes look rather uncomfortable, but I guess that is worth it for short intense efforts. Was there any testing done about spoke number and types? My miles are split between race wheels with 20/24 bladed spokes and “touring” wheels with 36 regular spokes and I feel like there is a decent difference, but maybe that’s placebo. If there is a difference, and if there was a dynamo hub that accepted bladed spokes, that may be a very efficient setup for rando rides. You cannot pedal in the full aero tuck. But when you are going downhill, you eventually get to a speed (for me around 30 mph), where the reduced resistance from tucking has greater benefits than pedaling at the highest power output you can muster. We didn’t look at spoke numbers, because others have done this. The best data I have seen is that going from box-section rims with 36 crossed spokes to full aero wheels with 12 or 16 spokes reduces your overall drag by about 3%. So did the students also publish in a journal? It would be really neat if someone would develop a high quality bicycle modeling sim, iteratively validated via this sort of testing. Probably not enough of a market to put that kind of effort into it; but still, should be good for a couple of PhDs. I’d love to see the equations that predict the conditions that produce shimmy! The students were the first authors of the Bicycle Quarterly articles. Those simulations already exist – for example, at analyticycling.com – but the problem are the input variables. The default values are far off the reality we found in the wind tunnel. However, with the data from our studies, you can go to analyticcycling.com and plug in some realistic numbers. Equations about handling and shimmy seem to be still some way off. Jim Papadopoulos and his group finally seem to have made some progress determining why a riderless bike doesn’t fall over, but once you add a rider and load, it gets very complicated. The take-homes from that little bit of reporting (for me) were: It’s easier to increase efficiency by 10% than power by 5%; take your gloves off; and wear an aero helmet. So, where should I mount my pump? In a bag would be best I suppose. I am doubtful of claims that placement of waterbottle and pump make a huge difference. Without a rigorous statistical analysis, you don’t know whether it’s just noise in the data, or a real effect. The main issue is frontal area. The aero tuck is so effective mostly because you reduce the frontal area by 33%. Hi Jan, a very interesting article indeed. Normally my seat is at a higher position than the handle bar and I was under the belief that this creates a more aerodynamic position as well, especially on the drops, but I am not sure if you article says the same. Can you please clarify? We tested both the on-the-hoods and the in-the-drops position, and the drops are more aerodynamic. As mentioned elsewhere, it appears that frontal area matters most, so as long as you lower your back, you get more aerodynamic. For the same reason, narrower handlebars (which we did not test) most likely are more aerodynamic. I’m always reading how you maintain the aero tuck even going round corners. I’ve been riding a number of years now, nearly always in mountainous terrain, but even on very familiar roads I dont’ have the confidence to go around corners in an aero tuck when I can’t see what’s coming towards me round the bend, or what may be lying on the ground or blocking the road… So I’m always shifting from on position to the other and I end up finding it’s not really worth it, as I’m never really in a great hurry. It depends on the bike. On a modern racing bike with narrow tires, there is no way I can maintain the aero tuck in a corner. With wider tires and a more precise steering geometry, it’s actually quite easy in a long, sweeping corner. It’s not so much about being able to maintain the aero tuck or not than about what’s after the bend. There might be a huge rock lying right across the raod for all I know, so I want to be ready to brake. Hence the movement to the drops. I agree that if you don’t know the road, or if you don’t have a clear sight line, then the aero tuck is a bad idea! The long, sweeping bends I talk about are on roads that see significant traffic and that have good sight lines. On tight, bumpy turns, I am in the drops as well.